Heartlands is just minutes from the A30 Pool exit. Parking charges apply, check website for details. For information on public transport to Pool, visit the traveline south west website. Coming from Redruth - at the traffic lights at the bottom of the town turn left. These lights have the estate agents on three corners. Drive straight along to the next big roundabout, keeping left, passing the pine shop which is on the right. You are now at another set of lights. Go straightthrough. Keep going straight on, past Taylors Tyres on your left. Set oflights again straight on. Past the Railway Inn on your left, Morrisons on your right, Lidl on your left. Next roundabout keep straight on. You will see Cornwall college on your right. B&Q on your left, McDonalds on your right, mini roundabout straight on. BIG TRAFFIC LIGHTS NOW. TURN LEFT HERE. Drive along this road, past Berendsen and you will then come to Heartlands entrance second on your left. Coming along the A30 from Truro and further North - Come off at Pool. You will pass Cornwall College on your left and come to the same big set of lights above, but go straight across. Drive along this road, past Berendsen and you will then come to Heartlands entrance second on your left. Coming from Camborne - Go through Tuckingmill up the hill to the same big set of lights above, but turn right. Drive along this road, past Berendsen and you will then come to Heartlands entrance second on your left. Coming from Helston - turn left at Four Lanes, through Piece, driving along towards Brae. Keeping on the same road bear right over the railway bridge. Turn left along Dudnance Lane. You will pass Tesco Extra on your right. You will see Heartlands Entrance on your right opposite South Crofty. Visit the Heartlands website for more information. Heartlands is a World Heritage Site Gateway and visitor attraction in Pool, Cornwall. 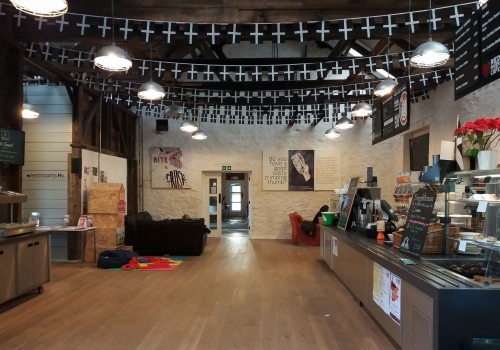 It has been dubbed as Cornwall's first free cultural playground. It was developed at South Crofty's Robinson Shaft and spread over 19 acres in the former mining heart of Cornwall. Heartlands is fairly flat, but there are a few gentle slopes here and there, though nothing steep. You can get to any part of the site by pathway. The disabled parking bays are along the Fordh-and-Bal road which is the road on the left before the main car park turning if you are coming from the A30, and the one immediately after the car park if you are coming from Tesco Pool Extra way. Follow the road along next to the Great Lawn and discover parking just after where the road bends round the the left. The parking is on the right hand side next to the wooden building (toilet block). Disabled parking is free and on a first come first served basis. There is lift access to the first floor within the Chi-an-Bobel building. Learn more about disabled access at Heartlands. Would you like FREE PARKING? Simply take the reminder tear-off slip with you, then use it anywhere on site on the day of issue to get up to the amount shown deducted from a purchase. You might choose to redeem your parking cost against a delicious coffee, hot chocolate or food in the Red River Cafe, or use it in the Chi Bar and shop, during the weekend of the Healing Light Festival. 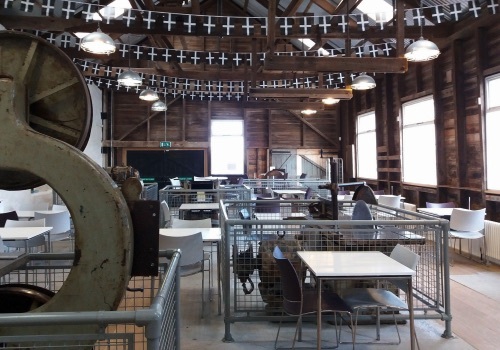 Discover fresh delicious food and a friendly smile at this atmospheric and cosy café based in the old Carpenter’s Workshop at Heartlands. The Red River Cafe is open every day from 10am until 4pm. Last orders for hot food at the Red River Café are at 15.30.